On 4 October 2016 a round table dedicated to the presentation of the study module “Integrated Water Resources Management” (IWRM), adapted to the universities of Kyrgyzstan, took place in Bishkek, Kyrgyz Republic. The event was organized by UNESCO Almaty Cluster Office in cooperation with the Public Fund "The Center "Cooperation for Sustainable Development" (Almaty, Kazakhstan) and the Department of water management and melioration of the Ministry of agriculture, food industry and melioration of the Kyrgyz Republic, aiming at improving the quality of education and training in the field of water resources in Central Asia. The round table was attended by more than 30 representatives of scientific and educational institutions, international organizations, local authorities and non-governmental organizations of Kyrgyzstan. The main objective of the round table was to introduce the participants to the IWRM course materials, adapted to the specific needs of Kyrgyzstan, as well as obtaining comments and recommendations from the participants for a wider use of the study module in the universities of Kyrgyzstan. The participants also discussed legal and institutional frameworks of water resources management in Kyrgyzstan, as well as the international cooperation on water issues. 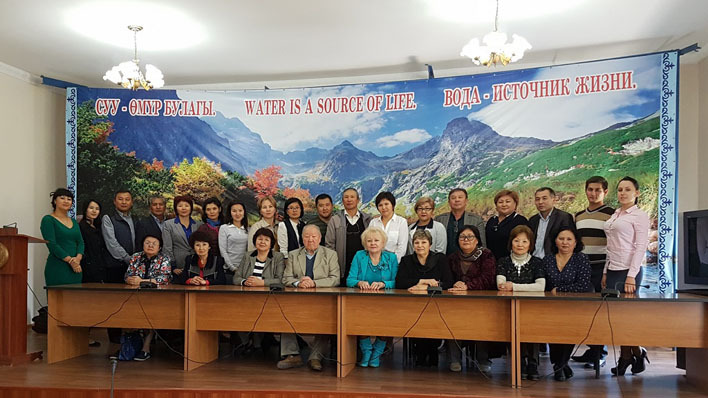 According to the comments of the participants, the use of this study course will contribute to capacity building in the field of innovative strategies for sustainable water management and promotion of IWRM in Kyrgyzstan. The adapted IWRM course materials for universities of Kyrgyzstan upon their finalization will be available on UNESCO Almaty website.